What’s Up With Batman’s Knightmares Story Arc? 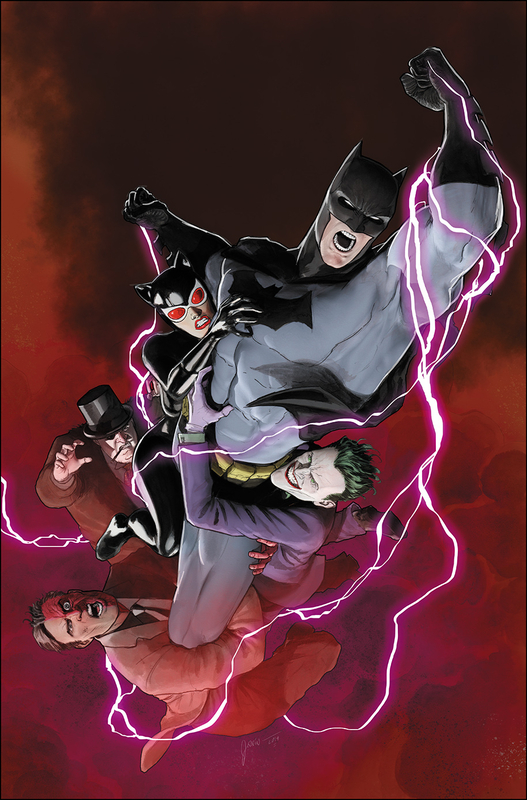 Batman #66 is due out 3/6/2019. By Zack Quaintance — The ongoing Knightmares story arc—which picks up here after a two-issue interlude that doubles as a Heroes in Crisis tie-in and a crossover with The Flash—is a tough one to review, at least on a monthly basis. The main trouble is that it’s really hard to contextualize the literal nightmare torture state our hero is trapped within without knowing what the payoff will be. We’re even lacking some basic info here, like who’s doing this to him (we can maybe safely assume it’s his father from the Flashpoint timeline), how long he’s been trapped, and, perhaps most importantly, why? This all makes it a bit tricky to gauge whether this story is working on a larger narrative level. With that in mind, I think it has to then be evaluated on the past merits of this run written by Tom King, as well as on whether it provides an entertaining individual reading experience. Let’s start with the latter: I think this issue most certainly does entertain. This issue is entertaining for two main reasons, and we’ll start with the first one since I have a bit less to say about. This is the most we’ve seen writer Tom King portraying Catwoman since Batman #50 ended with her leaving Bruce at the altar/on a rooftop, worried as she was that a content Batman would be bad for the world and for Gotham. This issue sees the as-of-late underutilized Question interrogating her about the Bat-Cat relationship and, in a broader sense, her wedding decision. If there’s one thing King has excelled at throughout this run it’s writing big Bat-Cat moments (with Batman Annual #2 standing out as the pinnacle of this run to date, with the possible exception of the Cold Days arc, which could be the best multi-part Batman story of the past decade). I for one have always found Catwoman the more interesting and less explored member of the pairing, and what this issue does (even if it’s not real real) is give us her more interesting perspective as she drags out a sultry cigarette like a character in a Golden Age Hollywood movie. It’s a great premise. What makes this issue really pop, so to speak, is the artwork. Jorge Fornes is a superstar artist waiting to happen, and, more precisely, a perfect fit for illustrating noir stories within the extant DC world. He doesn’t quite fit with the publisher’s house style, but he’s squarely within the lineage of the sorts of cartoonist they like to tap when they deviate from the photorealistic, think Shawn Martinbrough’s Detective Comics run with Greg Rucka, or Phil Hester and Ande Parks work on Green Arrow with Kevin Smith and later Brad Meltzer. It’s the type of Bruce Timm-esque cartooning that really accentuates the classic designs of the characters, we get so many glorious scenes of it here, bet it Catwoman tangling upside down in front of a diamond from a wire, or The Question leaning in with intensity splayed all over his (or her) expressionless facade. It’s truly special work, and if Fornes hasn’t already been tapped for more noir DC Universe cartooning, well that’s a missed opportunity. The last point I want to make is that in the context of the longer run, this faux reality Knightmares run asks readers for a pretty sizeable leap of faith, and I think that’s just fine. It’s the kind of ask the writer and his collaborators have earned after 66 issues, all but three of which I’ve liked (The Gift) and most of which I’ve absolutely loved. It’s an experimental take on Batman, compared to traditional depictions, and this is nothing if not an experimental arc. I say let them tell the story, give them the benefit of the doubt, and let’s talk again in six months.